The agave, neither cactus nor aloe, is a succulent native to North America. It generally has a stubby stalk with long thick pointed leaves. There are many varieties, most of them suitable for distillation. 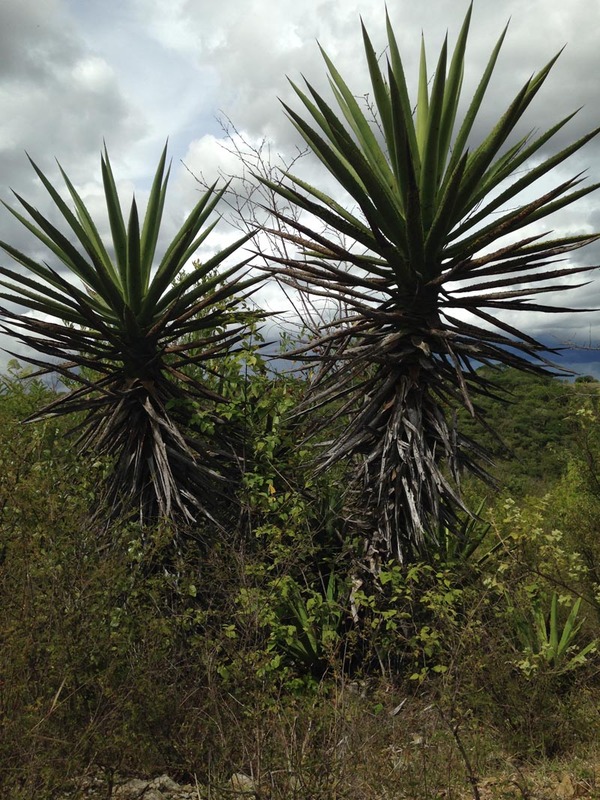 Alipús, and almost all other artisan mezcals, are distilled from the cultivated agave angustifolia, called espadín, which is the genetic ancestor of the agave Weber used to produce the mezcal known as tequila. 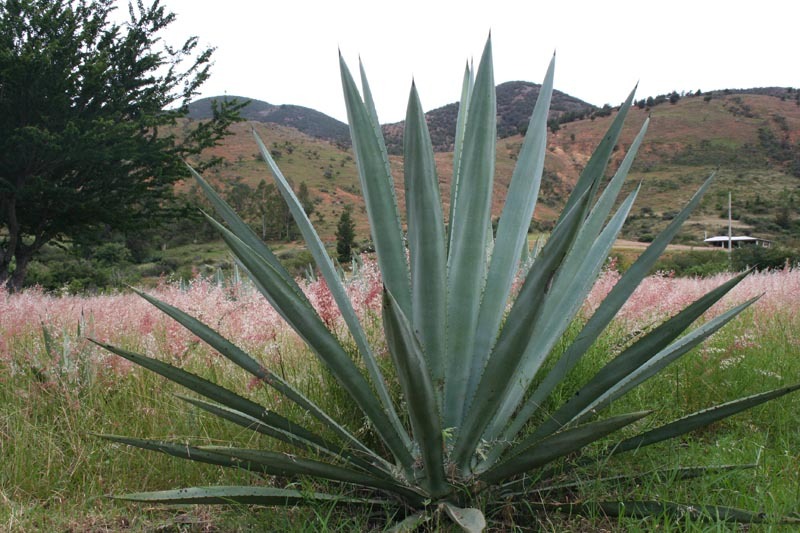 For photographs of other kinds of agave, see the Mezcalero page. 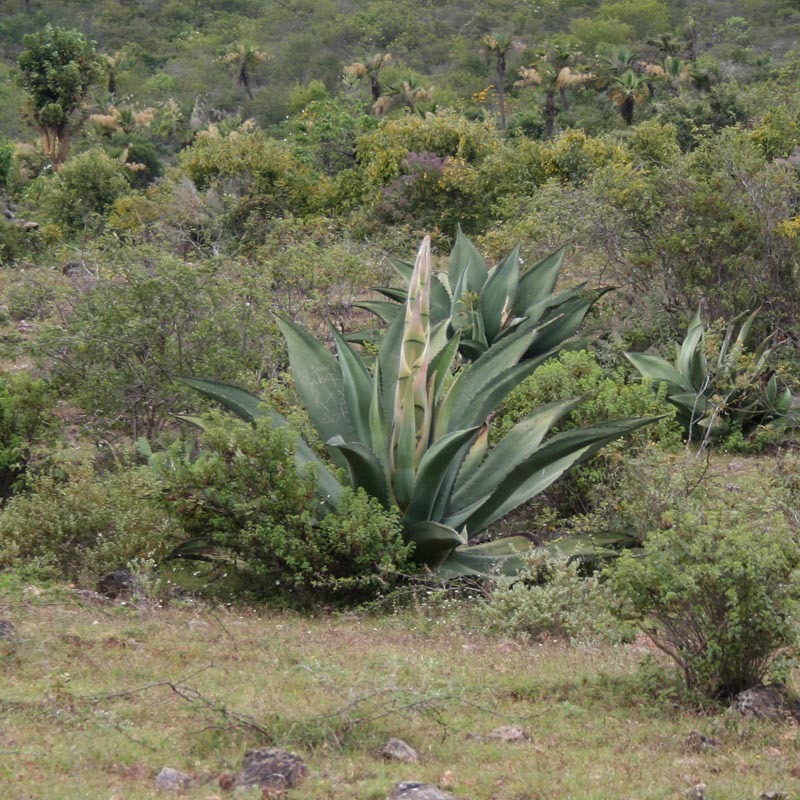 Agaves live for many years. Eventually, they put out a central stalk, flower, and die. 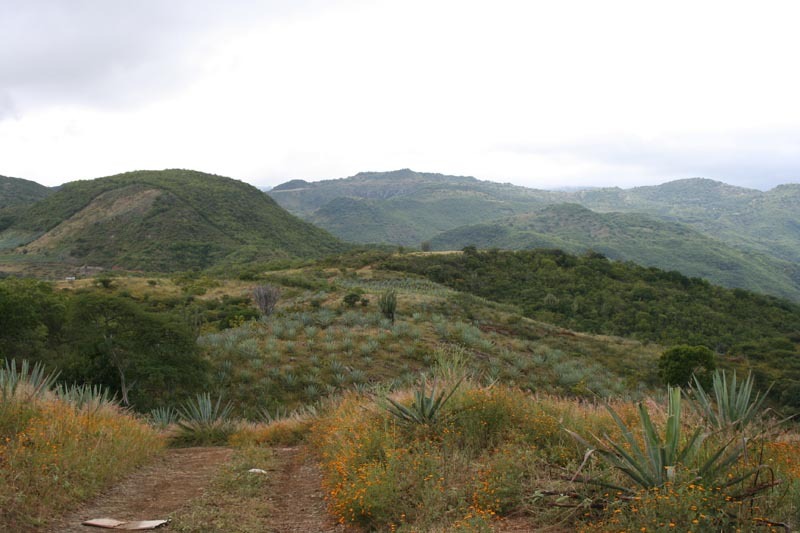 The cultivated espadín is ready for harvest after some eight to ten years, although people are cutting them at 5 or 6 years, producing mezcals that taste thin and green. 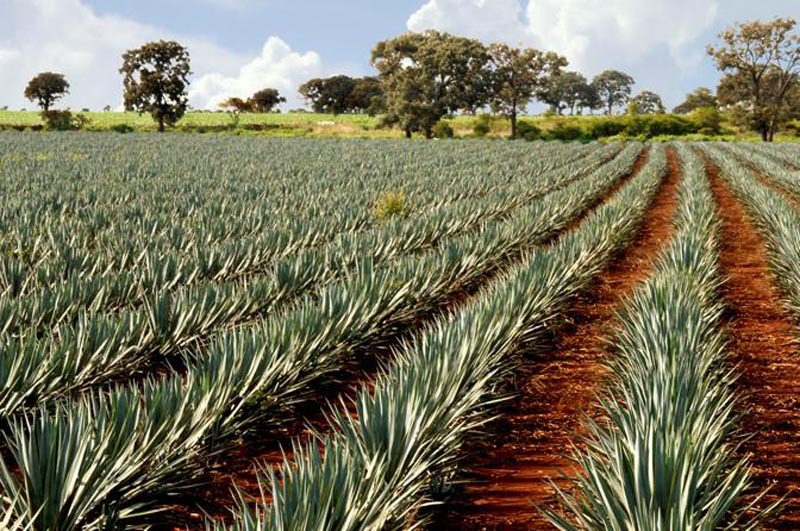 Other agaves take up to 15 years to mature. Above, espadín in an upland plateau above San Juan del Rio. It’s like grapes: put them in a place where they have to struggle a bit and you get better flavor and more complexity. Contrast the photo (left) of a tequila plantation. Steeper upland terrain creates elegance, clarity & depth of flavor, structure, length. 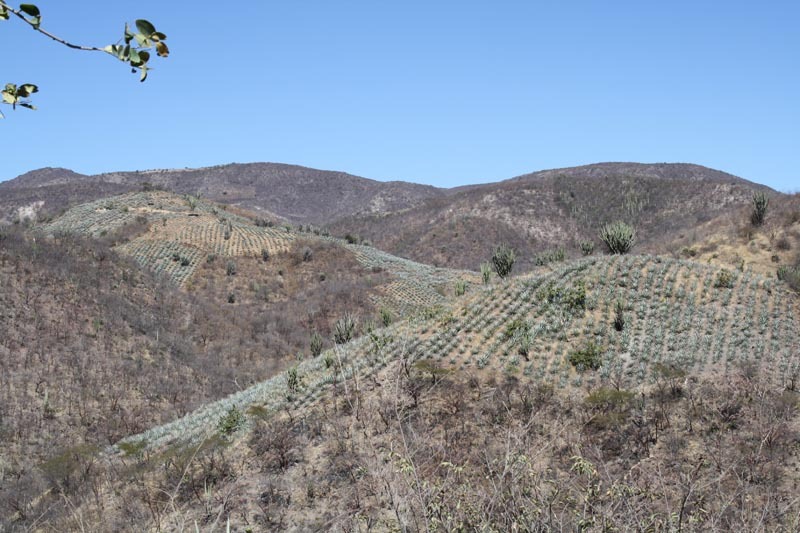 It is evident that the espadín, grown in widely separated plantings for generations, has developed regional variants, which is one reason artisanal mezcals differ in interesting ways. The agave is a complex plant. Before the development of corn, it was the major source of food and fiber for the indigenous population of Central America, and genetic analysis has shown that its seeds were widely traded. It was the embodiment of fertility, and yielded a sap that could be fermented into an alcoholic drink, pulque, used for ritual intoxication. It is perhaps the richest and most complex source for distilled spirits on the planet. Artisan mezcal is one of the world’s great distilled spirits. There is no distillate its equal fresh from the still. One of the great pleasures of artisanal mezcal comes from its being made from locally grown agaves. 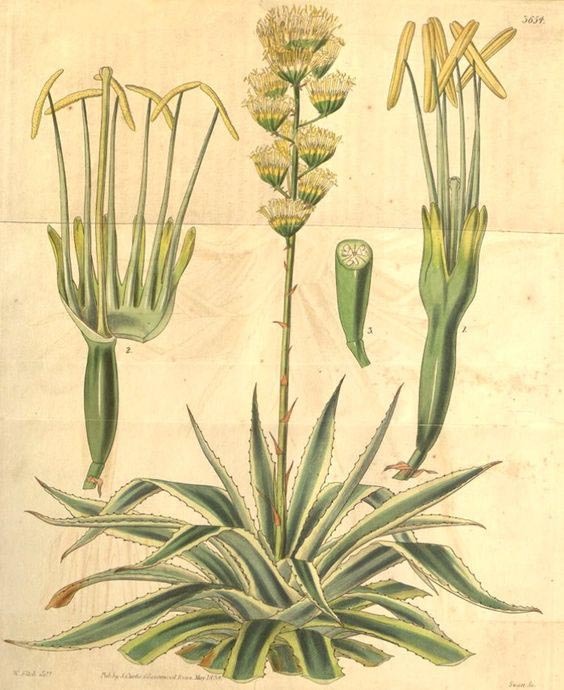 Like the grape, the agave has flavors and aromatics that derive from the soil and the altitude in which it is grown and from the local climate. 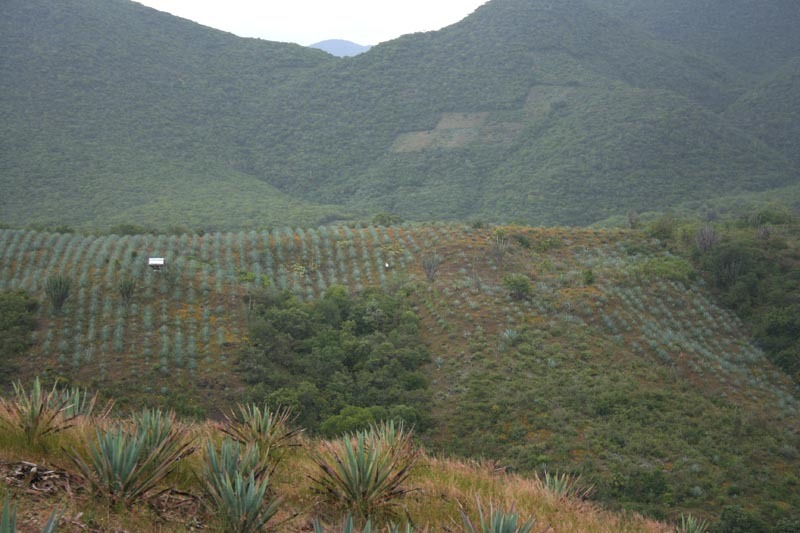 All of the Alipús mezcals are distilled from espadín (San Andres sometimes includes a touch of madrecuishe), yet each of the Alipús mezcals has a distinctive taste, some of it coming from differing distillation methods, but most of it coming from the fact that their agaves are grown in different parts of the great Oaxaca valley, which comprises almost 2000 square miles at an average altitude close to 5000 feet, and whose rugged terrain produces varied soils and varied microclimates. This aspect of mezcal is almost totally unexplored: the relationship between specific soils, specific regions, and specific flavors. 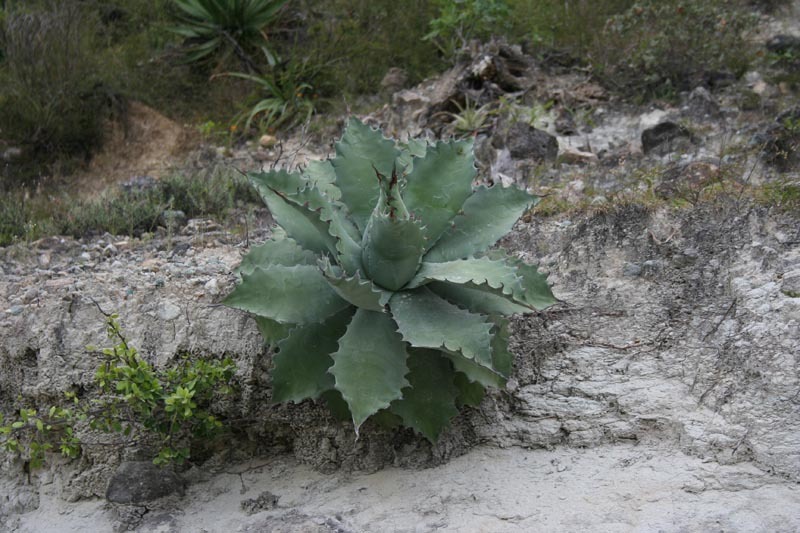 Because of the rugged terrain, many agaves are grown in fairly steep mountainside plantings. These near Santa Ana del Rio are in scanty, light (calciferous = chalky), and sandy-shaley soils. Compare this rich, reddish (ferriferous = has iron in it) and somewhat clayish soil (foreground) near San Juan del Rio.